The Andromeda table light is a stylish fitting with clean lines finished in satin chrome plate. 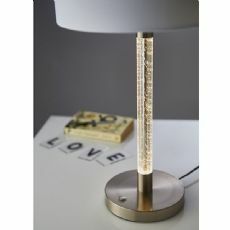 It features a clear acrylic section to the base, with a bubble effect which creates a beautiful effect from an additional LED light source. Supplied with a fabric shade, both the stem and main lamp can be lit separately or together. Compatible with LED lamps and matching items available. Their range of classic & contempory decorative office or home lighting fittings consists of over 1200 product lines to choose from. Their ranges include indoor and outdoor lighting as well as bathroom and kitchen lighting and other home furnishings.